It’s hard to believe that this desire to thank those on the front lines in digital mediums between customers and companies took off so quickly. The first year, it was just a murmur online and now it’s spread on its own to physical events around the world. I had nothing to do with the first group (Boston) leading the first ever physical event, but then quickly suggested that other regions (even my local area SF) to step up. 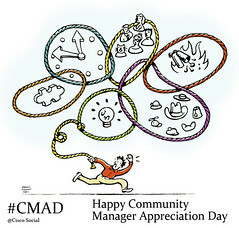 Below I’ll curate the interesting voices around the world at the 2nd annual Community Manager Appreciation Day. Physical events in Boston, NY, Austin, London, Barcelona, SF, Denver, Narobi, Amsterdam, Switzerland, Bolivia and Jordan. Connie Bensen from Alterian shares stats, also she shares what it’s like in the role. Dachis Group says your Community Manager is King! I just learned Bolivia had an event, see the FB page, pics here and here. I’m watching the various streams, and it’s very hard to keep up (data from Alterian found over 2000 tweets), but here are some select tweets. Some CMs get spoiled with thanks and delectable treats. Kindly leave a comment below and I’ll aggregate into this post. What’s success? In year 3 and beyond it just happens on its own, and I don’t have to promote if further, people forget that I spurred it. The real testament if our friends at Hallmark are able to get behind it. And most importantly, a sincere thanks to those Community Managers are forging the relationships between customers and companies using these new technologies. View more presentations from Connie Bensen. Stats how the day unfolded online from Alterian, see blog. Spiceworks, an online community for the IT community literally rolls out the red carpet for Nic, their CM, more details, and read Nic’s perspective (be sure to read the various comments from all threads). Boston was the first group to announce the first physical meetup and had over 120 registrants, see pics above, more here from SMC. 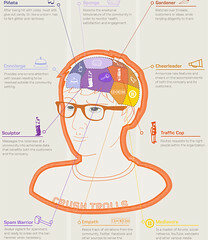 Get Satisfaction has an interesting infographic on this role. Yes, glitter farts. Cisco salutes CMs with this graphic, lasso time.